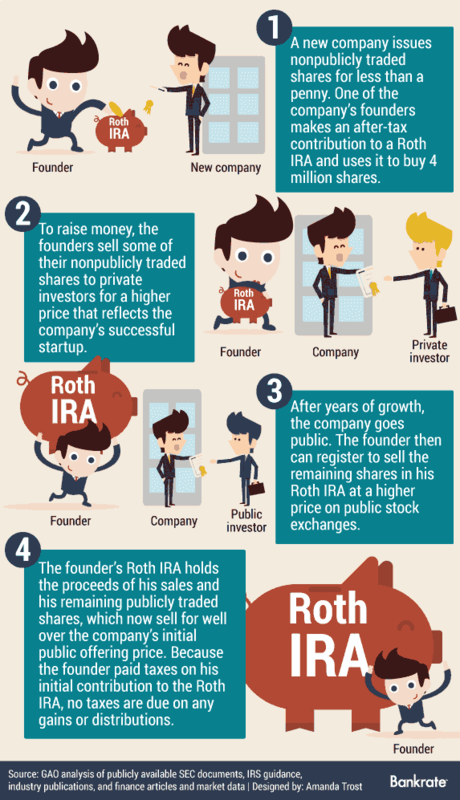 IRA Worth Millions A Tax Problem? Billionaire startup founders and private equity executives may have more of an advantage than you realize. If you put $5,500 in an IRA every year beginning this year and earn 6% returns on average, it would take roughly 42 years for your account to grow to $1 million. Yet, a very small percentage of the population has the opportunity to grow their IRAs to gargantuan proportions. Startup founders, for instance, may get the chance to put nonpublicly traded shares of their burgeoning business into a retirement account before the company goes public. If the company takes off, the price of the shares could balloon from fractions of a penny to millions of dollars. 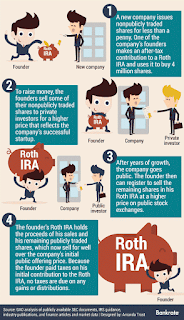 If that IRA account happens to be a Roth IRA, it's like winning the tax-free lottery since only contributions to a Roth, not earnings, are subject to tax. If it's a traditional IRA, Uncle Sam will get his due, eventually. That may be cold comfort for the taxman. In November 2014, the Government Accountability Office released a report suggesting steps Congress can take to close up the loophole, but not everyone thinks it needs to be fixed. "There are going to be cases that are extreme, but it's an honest system and encourages saving and personal responsibility. I don't think that is something they would want to tamper with," says E. Brian Finkelstein, a partner at Broad Financial, a provider of self-directed IRAs and solo 401(k)s.
The GAO's report broke down the landscape of IRA ownership and told how a few people came by their vast IRA fortunes. Source: GAO analysis of IRS data. From "IRAs: IRS Could Bolster Enforcement on Multimillion Dollar Accounts, but More Direction From Congress Is Needed." A handful of people have amassed more money than would be possible from prudent saving and wise investing. Instead, startup founders and private equity executives were able to build their balances by putting nonpublicly traded securities with very low valuations into their retirement accounts. "The investments are priced low because they are illiquid and there is no guarantee that they will have any value in the future. However, one would not go through all this trouble (of opening a self-directed IRA) if they did not anticipate rapid growth," says Stuart Caplan, chief investment officer at Apex Financial Advisors in Yardley, Pennsylvania. The GAO is concerned that a few people are using IRAs in a way that was not intended by Congress and that the IRS could be losing out on millions in tax revenue. "There are a lot of assets being held in the accounts, and the government wants to track it better so that when people are taking distributions of not cash -- assets -- they can be more sure that the assets are being valued correctly," says Jaime Raskulinecz, CEO and founder of Next Generation Trust Services, a provider of self-directed retirement account services in Roseland, New Jersey. For instance, if you own a racehorse through your IRA and decide you would like to take a distribution from the account in the form of 1 equine, the IRS wants to know how much that horse is worth to better calculate taxes owed. "A number of industry stakeholders we interviewed expressed concerns that individuals who invest in nonpublicly traded shares … using IRAs and (defined contribution) plans may undervalue these assets, thus substantially increasing their tax benefits," the GAO report stated. Investigating valuation issues requires hiring outside experts and attorneys, and that gets expensive. Taxpayers foot the bill, and the IRS has only 3 years to detect and go after improper valuations. The IRS now asks for the following data from custodians, the financial institutions that hold IRAs. How much of the IRA's value is attributed to nonmarket assets. The type of nonmarket assets. Identifies distributions of IRA assets that do not have a readily available fair market value. Questions about valuations often don't arise for many years. The GAO recommended expanding the 3-year statute of limitations on IRA violations. The report also suggested that a warning be added in Publication 590 about the risks of prohibited transactions and fudged valuations in retirement accounts. Limiting the types of assets permitted in IRAs. It's not just shares of startups that populate self-directed IRAs. Self-directed IRAs can invest in real estate, timberlands, racehorses, Broadway shows, cattle, precious metals and even interests in oil wells. Requiring a minimum valuation for an asset purchased by an IRA. Founders of startups and their employees may get nonpublicly traded shares valued at less than $0.01. Putting a cap on the amount of money that can be accumulated in IRAs. Congress could require an immediate distribution of balances above the ceiling, the report suggested. Technically, anyone can invest in alternative assets in an IRA, but they have to first find a custodian who will be willing and able to hold the account. It's a good idea to deal with experienced firms because a misstep could cause your IRA to become just an A -- with all the associated taxes and penalties. "Clients come to invest in, among other things, real estate assets -- maybe they buy a condo on the beach in Florida or the Carolinas and rent it. The IRA will hold it and all rent and expenses flow through the IRA," says Raskulinecz. "There has also been a big increase in clients that are making equity investments in startups or loans that may turn into equity investments if the startup gets a big infusion of capital or is sold," she says. Maybe one day those accounts will turn into mega-million-dollar IRAs. In the meantime, critics of the conclusions drawn by the GAO report, such as Tim Gagnon, say people need more carrots for retirement savings, not fewer. "They are going after an underlying issue that isn't the underlying issue. It's more worrying that people don't put money aside for retirement, rather than rich people with large accounts," says Gagnon, an assistant academic specialist of accounting at the D'Amore-McKim School of Business and program director for the online Master of Science in Taxation program at Northeastern University. Encouraging everyone to step up their retirement savings is never a bad idea. 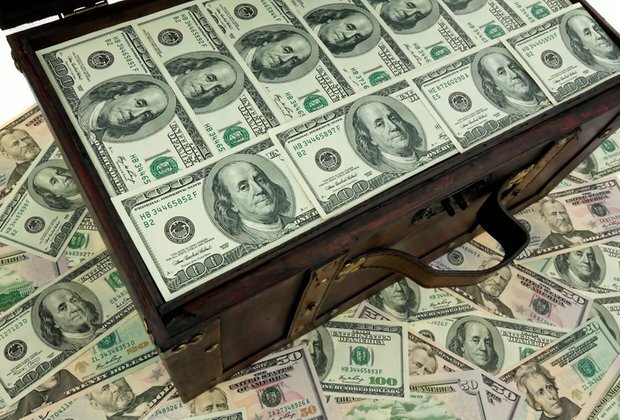 Is any real harm done if a few people manage to parlay their IRAs into a vast fortune?